Organized preservation efforts at Iowa State University of Science & Technology (ISU) Library, began in the early 1980s and have since developed into a dynamic and vital aspect of the Library’s mission. The Preservation Department was established in 1991 and currently includes three functional units: Preservation Services, Digital Initiatives, and Conservation. The Preservation staff consists of two professional librarians, eight full-time staff, and three FTE student workers. 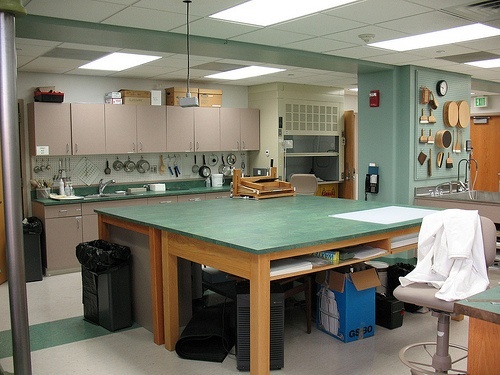 In 1995, the current Conservation Laboratory was built on the fourth floor of Parks Library. Three thousand four hundred square feet house the lab’s offices, workspace, and storage areas. Over half of the costs of the facility were raised from private funding, including the Lennox Foundation, ISU alumnus Tom Booth, and ISU alumna Betsy Anderson Booth. These donors have continued to support the endeavors of the ISU Preservation Department by funding the purchase of new equipment and establishing the Lennox Endowment for Preservation Education, Training, and Outreach. Visit our Lennox Internship page to learn more about the Lennox Foundation Internship for Preservation Education, Training, and Outreach. The Preservation Department’s social media efforts began in February, 2010, with the launching of this blog as a means to disseminate sound preservation information to the public, to communicate our perspectives on the field of library and archives preservation, and to connect and collaborate with preservation and conservation colleagues across the country and around the world. The department’s social media presence also includes a Facebook page. Visit our Contributors page for the names, photos, and job titles of our blog authors. Please note that the opinions expressed in this blog’s posts are those of the individual authors, and do not represent the official position of Iowa State University or Iowa State University Library.